Above: This white Rex rabbit with an enormous dewlap has just kindled a new litter. That bare spot under her chin is where she pulled fur from her dewlap in order to fill the nest and cover her babies with it. Yes, my does do tend to have ample dewlaps, don't they?! Most Rex Rabbit does have dewlaps, some bigger than others. If a rabbit has one, the dewlap reaches its final size as the rabbit reaches full maturity. Sometimes, at least in my barn, you can tell the older does by a dewlap that begins to sag away from the chin. Does of many breeds develop dewlaps, but many other breeds never do so. 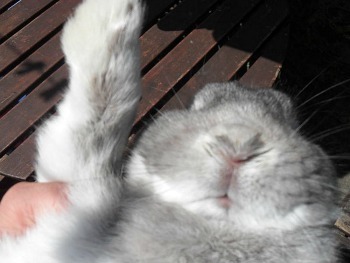 This is because in their breed, a dewlap may be considered a fault that mars the overall presentation of the rabbit. 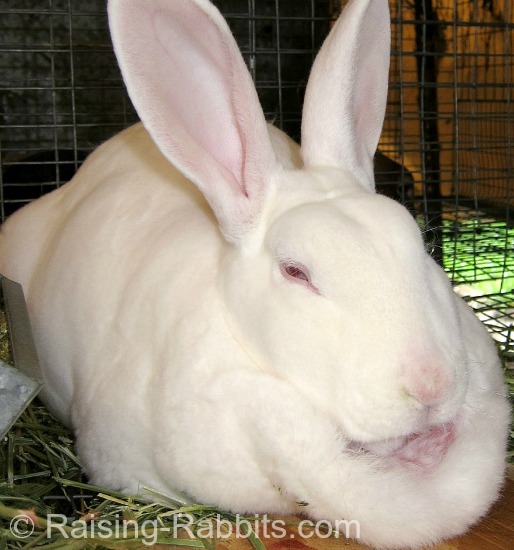 Over many years the rabbits have been selectively bred to not develop a dewlap. So if your rabbit does not have a dewlap, no worries. It most likely is not meant to have one. Below is one of my sweet chinchilla Rex does. She is 3 years old, and you know it from that dewlap of hers! Thank you Cindy for sharing your appreciation! Pasteurellosis in the Human Food Chain? Rabbits are susceptible to the ubiquitous bacterium, Pasteurellosis multocida. The most common disease this germ causes is Snuffles. Every rabbit rancher and rabbit breeder recognizes the need to not utilize sneezing rabbits for breeding. 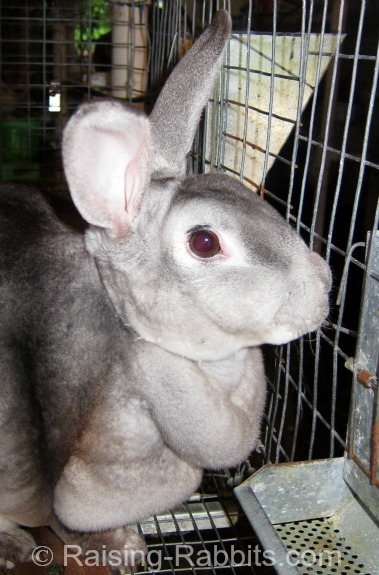 Livestock rabbits sick with Pasteurellosis should be culled. The practice of culling thankfully results in a herd of rabbits with strong immunity, meaning their bodies are capable of resisting and conquering P. multocida (and a reduced need to cull for sickness). Below: an otherwise healthy rabbit which sneezes every day. The wet nose and damp mats on the inside of the paw are classic signs of Pasteurellosis. When in doubt, always get a professional veterinary opinion to verify the cause of the symptoms. Under most circumstances the answer is no. Rabbits that have been processed due to symptoms of respiratory Pasteurellosis (for example, white nasal discharge and sneezing) are safe for eating. The reasons are several. First, the parts of the rabbit where the germs lurk (lungs and sinuses) are not typically a part of the meal plan. You will no doubt discard these. Additionally, P. multocida is already everywhere in our own environments; our human immune systems have been ably handling it for years. Lastly, cooking kills any and all germs. The meat itself is unaffected by P. multocida. A person who is severely immune-compromised, for example, on drugs that lower the immune system such as chemo and some drugs for autoimmune diseases, or are debilitated from AIDS, have rarely been known to fall ill from P. multocida. These individuals should probably not be raising any livestock, however there is no danger from eating such a rabbit. Australia presents a very long term and ongoing study of what happens when a PREY animal lives in an environment without predators. 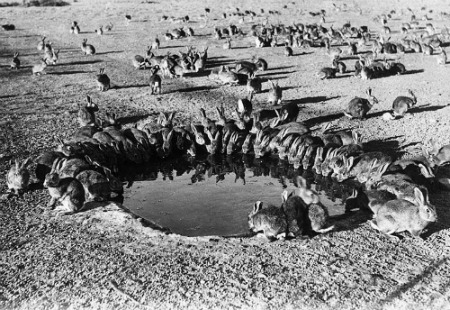 Over the last 155 years, an initial rabbit population of 24 (introduced into Australia so immigrants could hunt them and thereby feel more ‘at home’) has swelled to over 100,000,000 (that’s 100+ million and growing by the day), taking over 70% of Australia. The inability to control the runaway rabbit population is having global consequences, say the scientists.